Francine's Friends: Fuel the Fight Against Breast Cancer! Fuel the Fight Against Breast Cancer! 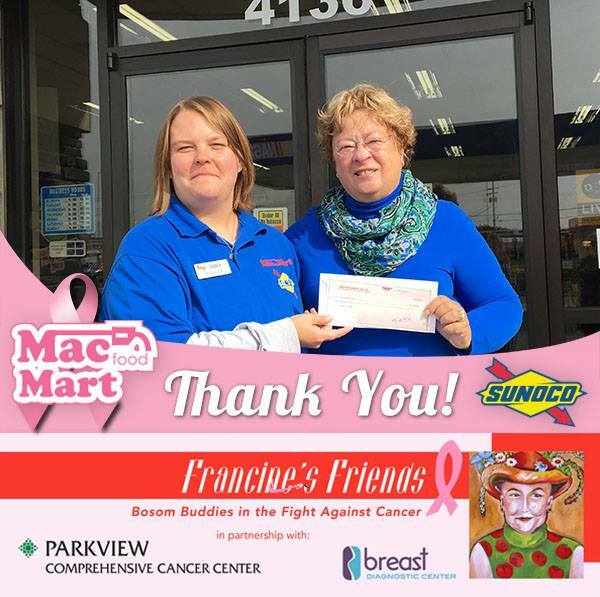 MacFood Mart/Sunoco recently presented Francine's Friends with a check for $200 - donations raised at their "Fuel the Fight Against Breast Cancer" event on October 14, 2016. "Last year we hosted a 'Fuel the Fight Against Breast Cancer' during the Grand Opening for our Goshen Road convenience store," explained Melinda McDonald, Media Coordinator at McIntosh Energy. "We wanted to host a very similar event this year to celebrate our one-year anniversary." The MacFood Mart/Sunoco station, located at the corner of Washington Center and US 33, sold approximately 2000 gallons of regular gasoline in a four hour timeframe, which is a LOT of gasoline! 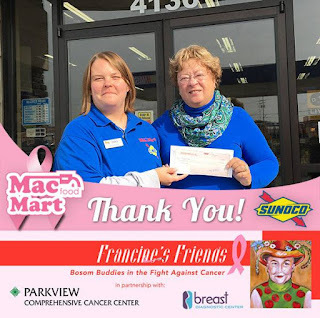 MacFood Mart manager Shannon Noble presented Francine's Friends board president Sharon Simmons with a check for the proceeds and thanked Francine's Friends for its work in the community.